Honda Jazz: winner collects car | What Car? Linda Rigby, the winner of our Honda Jazz competition, has taken delivery of her new car. Linda, from Rochdale, entered our Specification Game along with 17,000 other entrants. 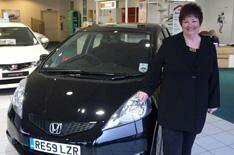 She was delighted with her new 1.4 ES model, worth 12,485, that she collected from Pennine Honda in Rochdale.